There was a nice piece about Boring 2010 in the Independent yesterday (look, that’s my face!) John Humpreys even mentioned it (the conference, not my face) on the Today programme on Radio 4 yesterday (skip to 1hr 44mins). Apparently Nick Ferrari also mentioned it (again, the conference, not my face) on LBC, but you have to subscribe to download the podcast and I’m not paying four pounds to hear Nick Ferrari laughing at me. I can get that for free at home. That joke doesn’t really make sense, as I don’t live with Nick Ferrari. He does look a bit like my boss though. I don’t live with my boss either. That is the best logo of all time. Although ideally it should be circular. 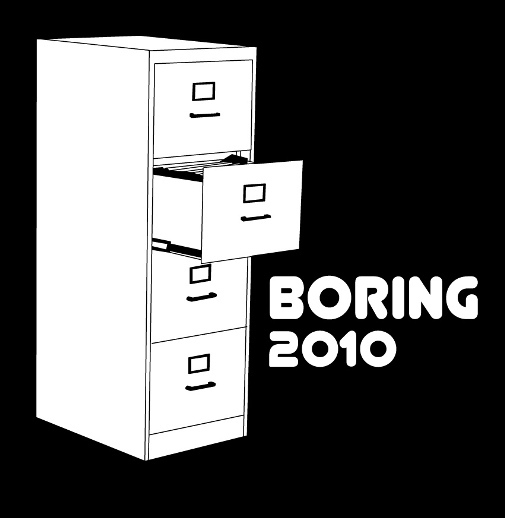 Bit disappointed as the top drawer open would have communicated the essence of ‘boring 2010’ better. I am not sure whether it will scale down well when printed on a very small advert. Also, it should have been circular. As I’ve just explained, I prefer squares. I prefer squares, I think I have made this quite clear. Great logo. Shame it’s not circular though. Aren’t you worried that loads of Civil Engineers might turn up? Or is it a an old wives tale that in the yellow pages under ‘Boring’ it said ‘See Civil Engineers’. Boy, am I glad this isn’t circular. What kind of sick freak would want a circular logo? Circular logos make me sick. This is a great logo. Has anyone suggested having a circular logo as an alternative? I am worried how Square badges are going to look. I would have preferred a circlular badge. I may have to reconsider coming to the conference. Bafflingly, a Google image search for “the most boring logo ever” returns pictures of naked men. Or is that just for me?